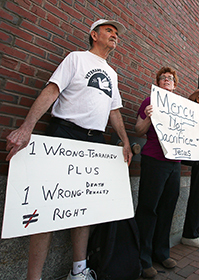 Will opponents of capital punishment continue to gain ground? Opposition to capital punishment is gaining ground across the nation, although the death penalty is still allowed in 31 states and for federal crimes. In May, Nebraska became the latest state to abolish the death penalty, and several others have placed moratoriums on executions while courts examine the issue. Fifty-six percent of Americans now support the death penalty, according to one poll, a drop of 22 percentage points from peak support in 1996 and a 6 percentage point drop from 2011. Opponents cite factors such as rising costs, questions of innocence and botched executions in their arguments against capital punishment, while proponents say it is important to public safety. In June, the Supreme Court upheld the constitutionality of lethal injections using a controversial drug.